Recognized by the American Medical Association as allied healthcare professionals, certified athletic trainers (ATCs) specialize in preventing, recognizing, and managing injuries that result from physical activity. Our ATCs work in high school training rooms to create strength and flexibility programs designed specifically to prevent injuries. They offer consultations for acute and chronic problems, perform preventative/supportive taping and bracing, and provide nutrition and weight training counseling to keep athletes in peak condition. 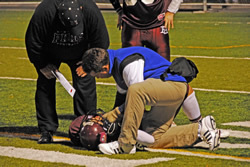 As highly skilled professionals, MORE ATCs provide on-site emergency care for acute and catastrophic injuries at sporting events. When appropriate, our ATCs refer athletes to physicians or to our physical therapy staff for further evaluation and treatment. This direct line of care from the athletic field to the physician and/or physical therapist provides for a safe and rapid return to play. In addition to supporting local high school sports programs by providing the services listed above, MORE’s ATCs have provided athletic training services at a variety of athletic competitions including the USTA Women’s Jr. National Tennis Tournament, Santa Clara University Rugby and Lacrosse, San Jose CyberRays and FC Gold Pride professional soccer, San Jose Storm professional volleyball, the VISA National Gymnastics Championships, Stanford University Tree-athlon, and the Pacific Rim Gymnastics Championships.